Shouldn’t these facts serve as reasons to use electrochemistry in order to run organic reactions directly, without involving all the waste associated with chemical reducing and oxidizing agents (we’re talking about chromium, lead, etc)? Think about it: if you pay electricity bills on time, electrons coming out of your electrical outlet will cost about 0.5 cents/mole… Curiously, the aforementioned considerations are not good enough to ensure widespread adoption of electrochemistry (otherwise there will be a lot more papers on this subject). The reason for this neglect lies in a steep barrier to entry into this field. Shockingly, I just realized that our last electrochemistry paper came out almost 10 years ago (http://pubs.acs.org/doi/abs/10.1021/jo048591p)… This work was done together with Tung and Christine Picard (now a Professor of Biology at Indiana U.: http://biology.iupui.edu/people/christine-picard). Ensuring continuity of projects is a big challenge in academic research and we somehow dropped the ball on electrochemistry in 2005… Now let’s fast forward to 2013. During this Christmas break I reasoned that it would be a perfect time to take our old Amel power supply off the shelf and see if that bad boy can still perform. Thankfully, Dmitry Pichugin was willing to help. Several years ago, Dmitry worked in my lab under the guidance of Igor Dubovyk. During his stay with us, Dmitry published a nice Angewandte paper together with Igor (http://onlinelibrary.wiley.com/doi/10.1002/ange.201100612/abstract). Of significance to our electrosynthesis aspirations, Dmitry is well versed in matters related to instruments and engineering (at the moment, he is working in our Departmental NMR facility). 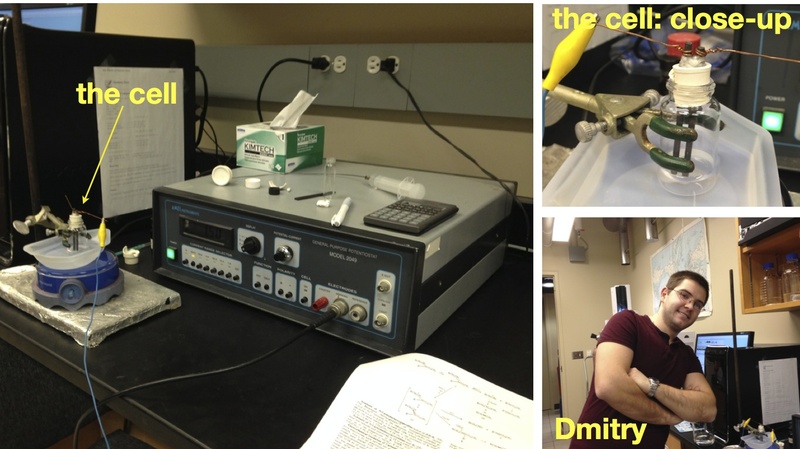 At 3:21pm, Dec. 27, Dmitry and I gave our Amel instrument a 2013 tune-up. 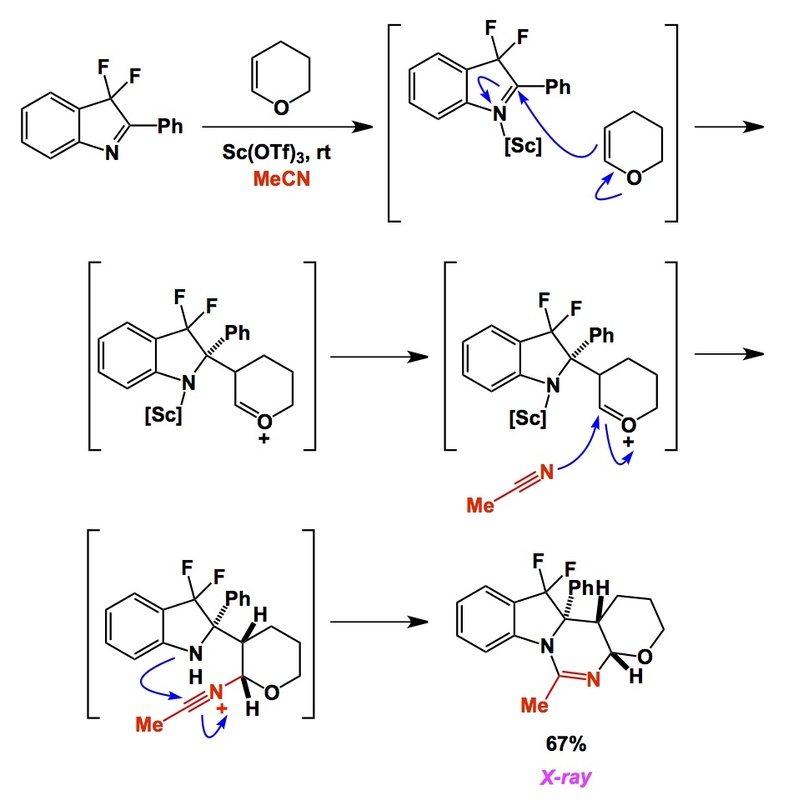 Shono’s alpha-alkoxylation reaction (http://pubs.acs.org/doi/abs/10.1021/ja00848a020) was our test case. Do you want to see the easiest CH activation possible? Here it is! 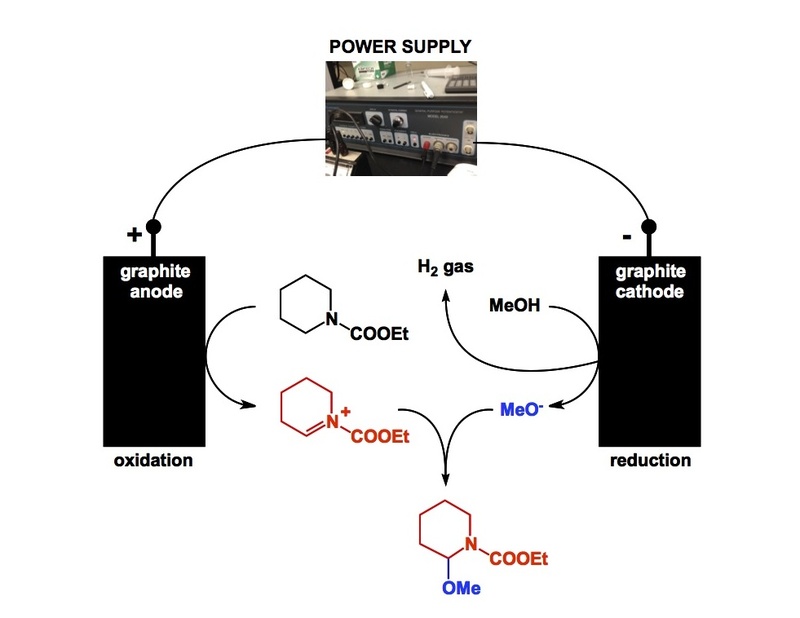 In the graphics shown below you will see our power supply and the reaction setup (2 graphite electrodes immersed into a methanolic solution of ethylpiperidine carbamate mixed with tetrabutylammonium tosylate as the supporting electrolyte). If you want, you can run this alkoxylation chemistry using graphite pencil inserts, it’s that simple. When I saw hydrogen bubbles at the cathode, I knew we were in business. Dmitry and I did not intend to push this reaction to completion. We ran it for 1.5 hours and just wanted to see the product. My PhD student Jeff St. Denis helped with the GC/MS analysis (thanks Jeff!). The most important outcome of this experiment is that things are working, we now have an updated standard operating procedure (even I can use this setup now), and I certainly hope that we will re-introduce electrochemistry back into our bag of tricks. On this gloomy Friday evening in Toronto (accentuated by the fact that we were supposed to go to the movies with my wife, but I purchased the tickets online to the wrong theater…), I am going to talk about some thought-provoking radical chemistry. Earlier today, I was talking with my PhD student Jeff about some radical-related matters relevant to our own research. This discussion brought to light a paper that I have always found fascinating. The work deals with facile generation of acyl radicals. Acyl radicals are not that uncommon, especially when generated from seleno- and thioesters. However, radical cleavage of an aldehyde’s C(sp2)-H bond is a less precedented reaction that raises a few eyebrows. Back in 2005, Tomioka and colleagues reported a marvelous example of this process. In their efforts to add nucleophilic thiol-derived radicals to double bonds (with the ultimate hope of making 6-membered rings), the authors serendipitously discovered that thiol radicals prefer to abstract the aldehyde’s hydrogen, leading to facile generation of acyl radicals directly from aldehydes. The resulting intermediate went on to form the cyclopentanone shown below. 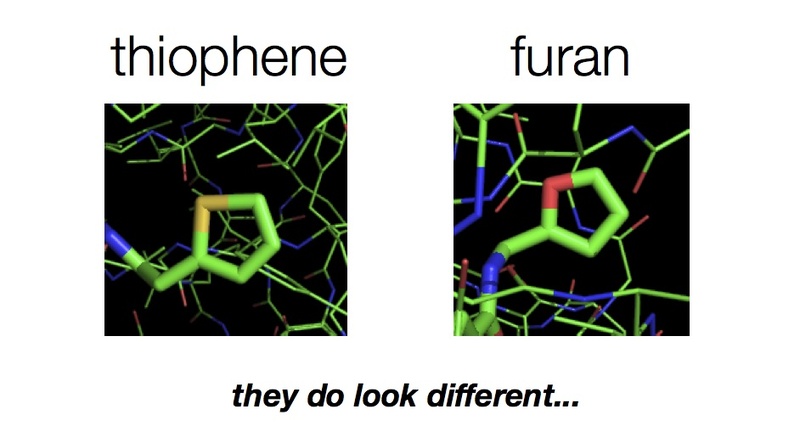 Several years ago, Stoltz and co-workers put this chemistry to good use in their synthesis of cyanthiwigin F (http://www.nature.com/nature/journal/v453/n7199/full/nature07046.html). Tonight I am happy to host Adam Zajdlik, a second year PhD student in my lab, on my blog. Over the past year or so, Adam has been tirelessly pushing the frontiers of boron chemistry. I was hoping that he would share some of the “tricks of the trade” on this page. Because TLC and its significance came up on this blog recently, it is fitting that Adam has his favorite spot visualization method to share. Here is how Adam develops boron-containing molecules in his TLC experiments. “Curcumin is a diarylheptanoid found in the popular spice turmeric. It is a highly conjugated diketone and its enol form is thermodynamically favored (see inset A below) as it allows electron delocalization across the entire molecule. An interesting feature of Curcumin is its ability to coordinate with boronic acids to form brightly colored boronate conjugates (inset B). During the coordination process, electron density is donated from the curcuminoid pi system to fill boron’s valence shell. This lowers the LUMO of the pi system and leads to a red-shift of its UV/vis absorbance. 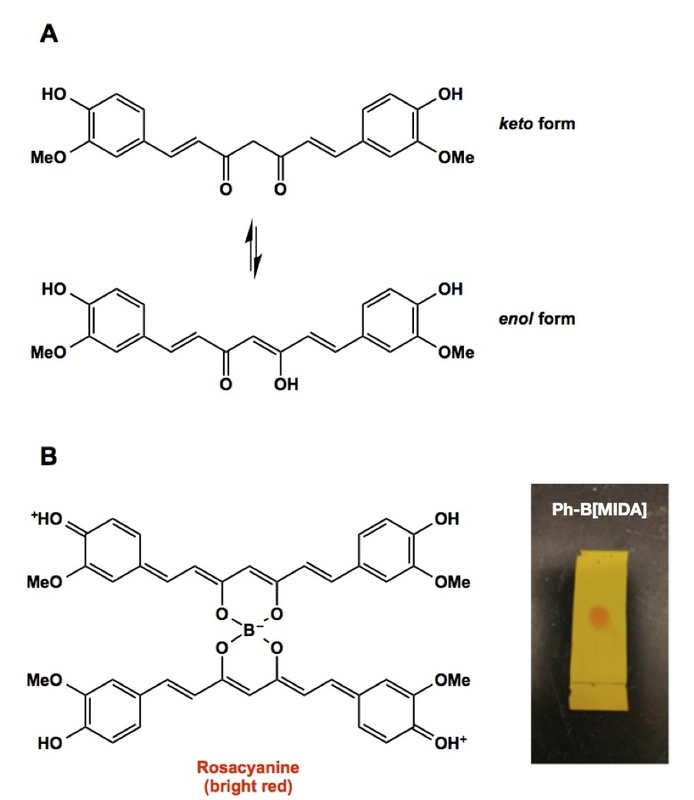 Boron-coordinated curcuminoids are bright red in color, while curcumin is yellow in the absence of boron. Acetonitrile is rapidly turning into one of my favourite reagents. Its nucleophilicity can be quite instrumental under special circumstances, which is why acetonitrile is not just an overpriced HPLC solvent whose cost goes through the roof whenever Chinese economy tanks. The Ritter reaction instantly comes to mind whenever the nucleophilic properties of acetonitrile are considered. Of course, there are other examples, particularly in the organometallic literature. Below is a recent case published by Lavilla and coworkers. This chemistry reminds us that acetonitrile can be a useful stitching element when employed at the right place and at the right time. The multicomponent reaction developed by the Lavilla group involves a cyclic imine that, upon activation by a Lewis acid (scandium triflate), undergoes a Mannich-type process. The resulting oxonium endpoint cannot undergo Povarov ring closure (my colleague Doug Stephan might call this a “Povarov-frustrated oxonium ion”). It appears that the oxonium ion’s reluctance to undergo Povarov reaction with the aromatic indoline fragment is due to geometrical constraints. Well, mother Nature hates voids and acetonitrile gladly fills the gap. The nucleophilic addition leads to the formation of a nitrilium ion (a special “hello” to my lab members is due at this point – they know what I am talking about), which is rapidly trapped by the nitrogen center. This is an awesome new multicomponent reaction that is rooted in the exceptional properties of acetonitrile. A week or so ago I had a discussion with one of my former students about what constitutes the most important skill to acquire in preparative synthetic chemistry. This is a complex and multilayered question simply because we have so many methods in our disposal. The list grows as new ways of interrogating molecules become accessible. Sometimes I think that we have way more than we need, to the point that instrumental cornucopia stifles the development of solid synthetic skills. When I was in graduate school there was a visiting scientist in our lab who was having a difficult time coping with his daily lab duties after our GC/MS machines broke down. This is an unfortunate situation that speaks to the “instrument addiction”. What did synthetic chemists do 40 years ago? They had less instrumentation, but I bet they were better prepared to do experimental science because they had no choice but to be resourceful. I do have some extreme views in this regard, as my students would testify. On a number of occasions I mentioned that we should just get rid of our two LC/MS systems because they provide too many false positives as well as false negatives (the worst possible combination!). Now let’s get back to what I would consider to be the most important skill to acquire. I suppose that once an experimentalist knows how to efficiently isolate his/her products and set up reactions, everything comes down to following the reaction progress and developing top-notch observation skills. To me, it is all about TLC (thin-layer chromatography), which is the most accessible and rapid analytical tool possible. I think that we need to develop behaviours that are close to obsessive-compulsive in regards to how often we run TLC of our reactions and how early we apply our first TLC spot in a given case. How often should one take a TLC measurement and when is a good time to take the first one? This is case-dependent and I am going to provide an example that strikes at the heart of the problem and makes us think (especially those of us who routinely deal with fairly unstable molecules). The reaction above comes from a total synthesis published by E. J. Corey and Scott Snyder several years ago. Scott told me about this example at a conference. If you run your first TLC of step 3 at 4 minutes after its start, it is too late and you will not get much product because the molecule is too unstable under the reaction conditions. However, once the reaction has been properly worked up after 3 minutes, the target molecule is isolable. I am sure there are many more examples like this out there and they all serve an important lesson. If you are a student, imagine that you are trying to make a sensitive intermediate and you are screening conditions that result in the infamous “messy TLC” description in your lab book. When did you take your first TLC?